Launching a boat from a trailer can be tricky, but a little preparation and planning can make it fast, easy, and even fun. Launch ramps can become crowded, especially on Friday afternoons or holidays when just about everyone wants to be on the water. It is essential to be prepared so you can launch as quickly as possible and open the ramp for the next boater. Try to schedule your first launch on a weekday when there is less activity. Also, complete as many steps as possible in the parking area before you back your boat onto the ramp to minimize time spent on the ramp. Make sure the plug is in! Most trailered boats have a drainage plug to release excess water while it is on the trailer. Remember to reinsert the plug before you put the boat into the water or you will not get very far. Load the boat while it is still on the trailer — coolers, life vests, and everything else you will take with you. Loading the boat before you launch is much easier than carting your gear down to the dock after the boat is in the water. Make sure your engine is up! If your boat has an outboard or stern drive, keep the engine raised while backing down the ramp. Untie, unclip, or unbuckle any straps. All straps used to secure the boat to the trailer when towing the boat should be removed before you get to the ramp. Put your fenders out. This will protect your boat from bumping against the dock or other boats while launching. Insert the key into the ignition. This way, you can quickly start it and navigate to a dock space if needed. If there are no spaces available, you may have to wait for one to open up on the dock. Attach a line long enough to reach the dock from the boat. If you are launching alone, try to position the line on the dock somewhere you can reach it. If you have a crew, have someone stand on the dock with the line while you are putting the boat into the water. Another option is a boathook—a telescoping rod with a hook at the end that you can use to grab a cleat or a rail and pull the boat toward the dock once it is in the water. Keep the winch line on. 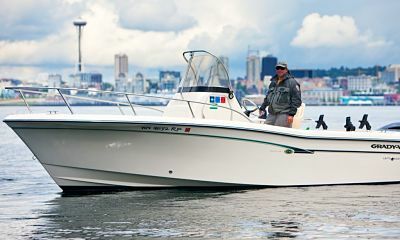 When you are ready to back into the water, the only thing holding the boat on the trailer should be the winch line—the line that connects the boat’s bow to the crank and pulls the boat to the front of the trailer for towing. Back down the ramp slowly. Launch ramps are steep, designed that way to get your boat buoyant before your vehicle’s tires touch water. Check the rear and side view mirrors to see when the stern of the boat starts to rise, indicating that it is in the water. You should be able to pull the boat off of the trailer when the trailer’s wheels are in the water. Backing down the ramp can be the trickiest part. The trailer will move the opposite direction that you turn your vehicle’s steering wheel, meaning that the trailer will swing the opposite direction of the rear end of the vehicle. Release the boat by loosening the winch line. You will have to get out of your vehicle to do this. (Set the emergency brake any time you get out of the car or truck on a launch ramp.) It is important to not back the vehicle down so far that you cannot reach the winch line. Again, if you are alone, you will have to check this yourself. Otherwise, one of your crew can be a spotter. At this point, you can either back down further to get the boat afloat and off the trailer, or pull the boat off the trailer using a line and/or boat hook. Some people like to start the boat while it is still on the trailer. Check that the outboard or stern drive is down. When the boat is off of the trailer and secured to the dock or otherwise controlled, return the trailer to the parking or storage area, get the crew onboard, and go have some fun! The hardest part of the day is over!